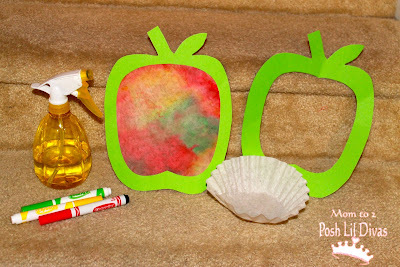 I was prepping this little apple art activity for my preschoolers this weekend when the Lil Divas decided they wanted to make it too. We haven't had much crafty time since school started so I happily obliged and I loved how they turned out. Which of course meant that I felt compelled to share it with you all. 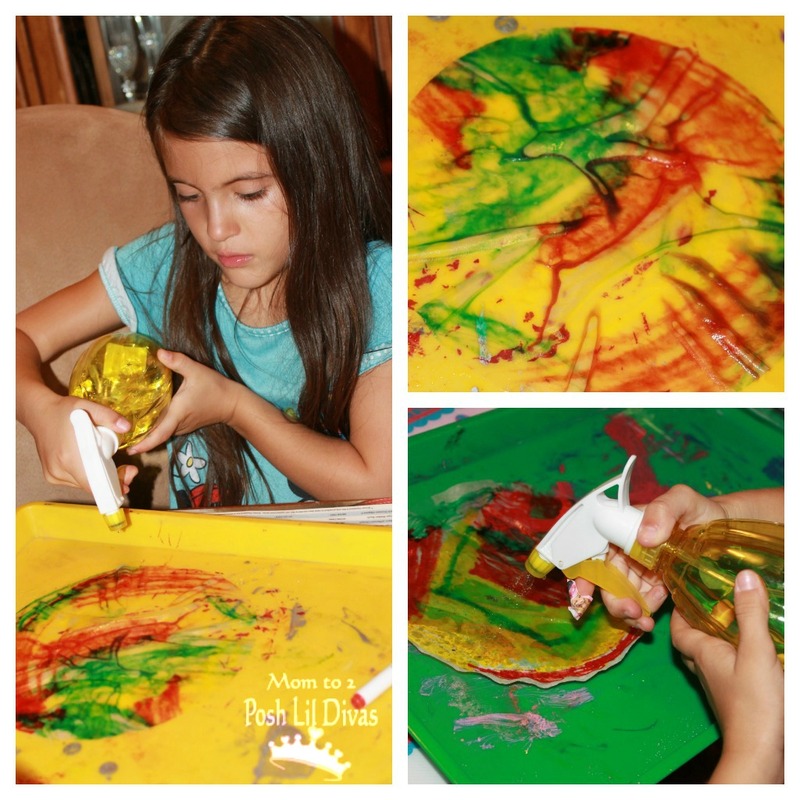 This one is so easy and the results so fun - perfect for kiddos of all ages. Let me know if you have any issues with it. 1. 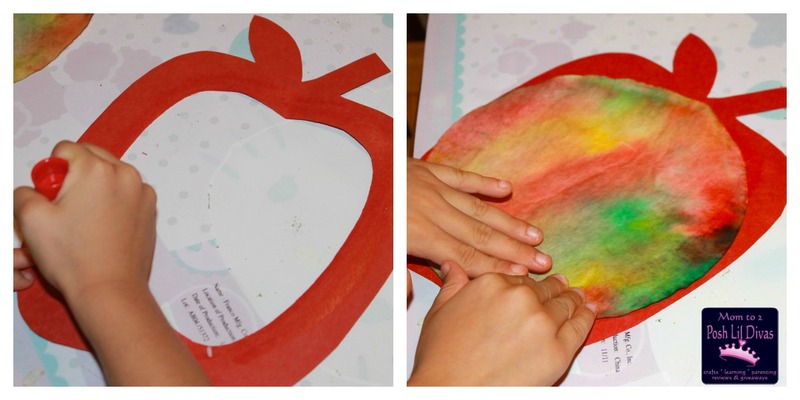 Have your apple template ready - I precut large apple templates for my preschoolers in red, yellow and green. I folded them in half and cut out the middle (see photo above). 2. 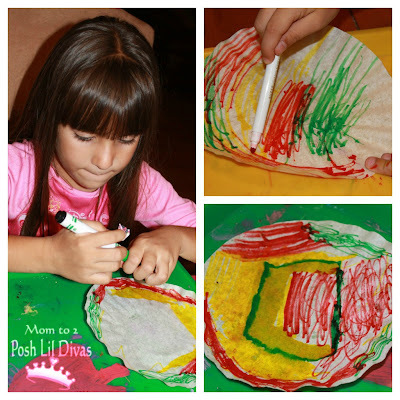 Have child color coffee filter using all 3 colors - the more area they color the more vibrant your colors will be. 3. Using your spray water bottle, spray water directly onto the coffee filter. Try not to overspray the filter - a little water goes a long way with this. Observe your colors mixing with each other. The Lil Divas really enjoyed watching this part. 4. Let coffee filter dry - this doesn't take too long since they are thin. 5. 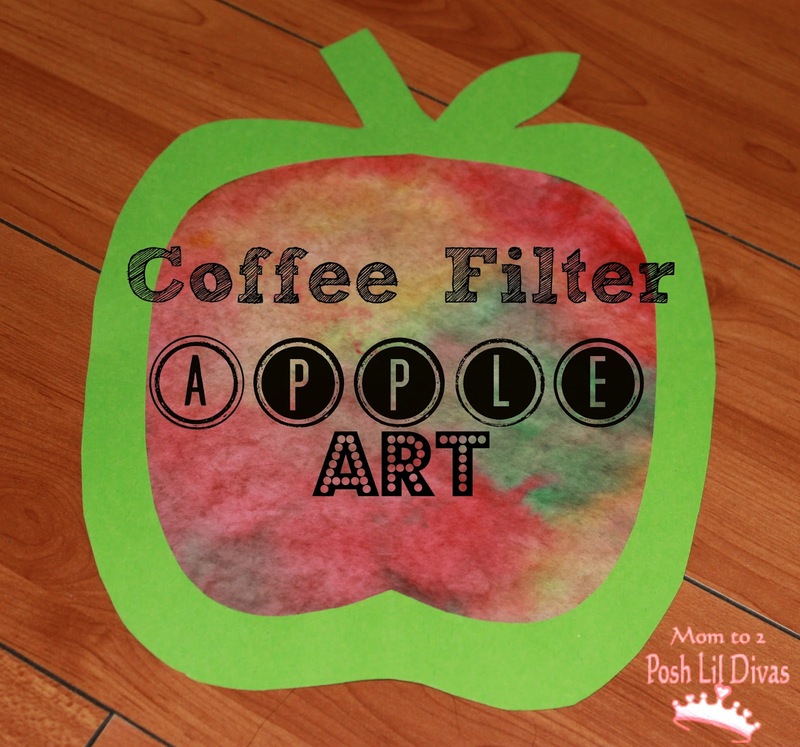 Glue coffee filter to back of apple template. 6. Check out your fab apple art and proudly display - this one definitely deserves a spot on the window, wall or fridge! and our favorite apple themed books list. 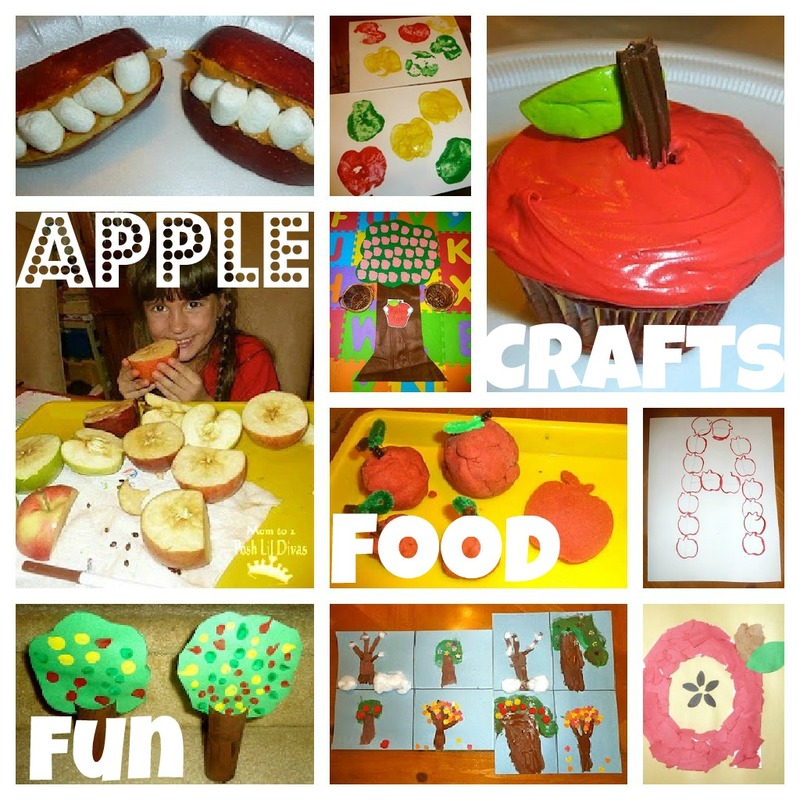 Update - I uploaded a PDF of the apple template I made and used for this activity. I emailed it to those that left e-mail addresses in the comments below requesting a copy but everyone should now be able to freely grab it when you click the link in the post. Let me know if you have any issues grabbing it. Enjoy! These are great, I just love them! Do you have a favorite apple template that you can share? If possible could you email me this document as well? I would love to do these with my kinder kiddos next week! Thanks! I would love the template as well. Thanks! Could I get it as well? Thank you! Could I have it as well. I would love to do this with my class. Thank you for your consideration. I teach second grade and my kids will love this activity! 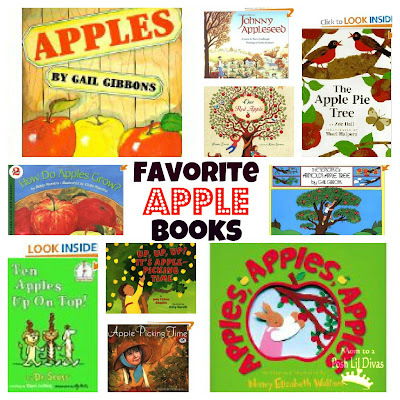 Great way to celebrate Johnny Appleseed and fall. Thanks! I loved your apples! I tweaked your idea and turned them into stained glass windows with my special needs class. 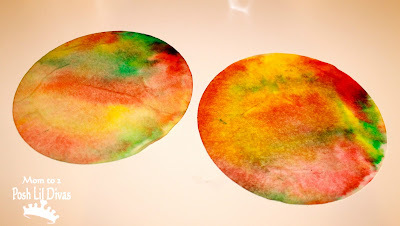 After the coffee filters mix colors and are dry, rub a little bit of vegetable oil on them and let them dry again. Once they're dry for the second time, glue them between TWO apple cut outs. 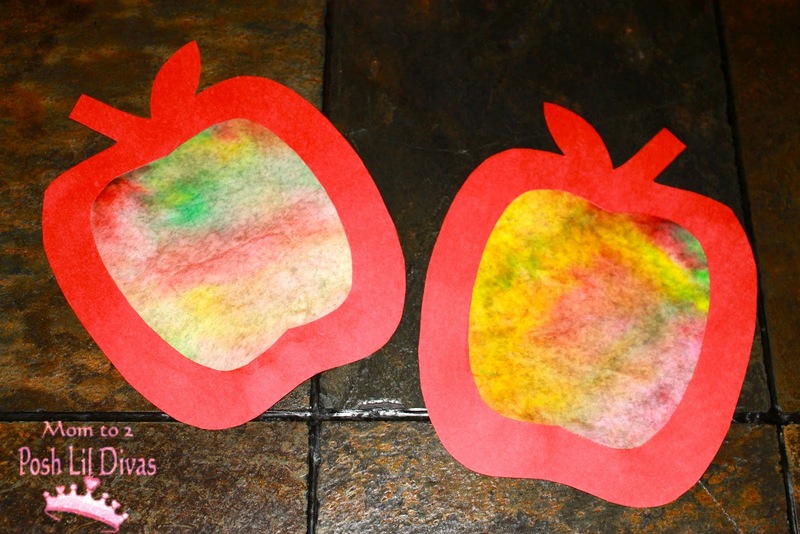 They can hang in your windows as stained glass.Thanks for the inspiration! I love these! I can't wait to make them with my girls! I love these! I wanted to do the one with contact paper, but contact paper is such a pain! I'm going to make these on Friday with my preschool class. Meghan, this was super quick to do for my 3 yr olds. We did it today and it went great. Just have to watch they don't spray too much water. That was the tricky part, hehe. Awesome. They turn out so beautifully! Love this!! Would you consider posting your apple template? I would love to do this with my preschool classes! Hi Mindy! I will try to get it up on here tomorrow for those of you that have asked about it. I also would love to have a copy of the apple template. Thank you! This would be a great way to make leaves also. So pretty. Pinning now! Love this! We will be making these in the classroom this week!! Thank you very much for sharing.. Also love the idea in the above comments on using the same idea on leaves!! Awesome. I didn't have any trouble getting your template! I loved this post! Thanks so much for sharing all those great ideas! I will definitely try the coffee filter apples! We made these today and they look beautiful! Thank you for sharing all your wonderful ideas! Big thank you for this wonderful art project and template. We can do this together! I did this with a 4-year-old boy that I nanny for. Turned out so cute! Thanks so much! can someone email me a copy for my preschool please? Thank you, thank you, thank you, I have been searching for something quick and easy to use as an extention of a literacy activity! Super cute and fun to make. Thanks so much for sharing! I can't wait to use this with my preschoolers! I would also like the template too! michelle_nicholls@hotmail.com Thank you in advance!! I just did this activity on Johnny Appleseed day with my Daughter. I homeschool, and thought this was a fun hands on activity. We made 5 huge apples. When we were done, my daughter wanted to do more and more!!! Thank you for this great idea!!! You could also use the outline portion of a diecut- the piece that is usually recycled. could I have the template of the apple please. Can I please have the template of the apple as soon as possible?? We already started with the coffee filter. These apples are so so neat! My kids are going to try making them this afternoon! I wondered if you'd be willing to let me link to this post in a fall kids craft round up I'm putting together on my blog. If I could link to it and use one of your pictures, it'd be great! This approach content may be a gratifying additionally advantageous a single, now I’m quite enthusiastic about this approach written subject matter. Let’s intend additional terrific articles or blog posts is possibly nestled together with article. At that time just click right construction company westchester county Enjoy it very much therefore additionally put imparting. Fun Ways to Decorate Easter Eggs with Kids!